TaylorMade-adidas Golf’s new Tour Preferred MB, Tour Preferred MC and Tour Preferred CB irons each are now available at retail. Although best known for its drivers and metal woods, TMaG was the top-selling iron brand in 2013 according to Golf Datatech, which tracks sell-through sells at on- and off-course stores. If you’ve ever hit TMaG irons, you know why they sell so well. A TMaG iron is solid, good looking and performs the way the company touts it to perform. At the Hyundai Tournament of Champions this past week, Dustin Johnson put a new set of the Tour Preferred MB irons in play. The MB (suggested retail price $1,099), according to TMaG, is an “authentic” muscleback player’s blade, precisely forged of soft, 1025 carbon steel. The shape is classic and compact, with a thin topline and minimal offset. Each MB iron also has minimal camber, something many top players prefer in their irons. TMaG says the Tour Preferred MC iron (SRP $999) combines a player’s shape with a shallow “muscle cavity” to boost MOI, creating a good look, as well as feel, workability and stability. The 3- through 7-iron incorporate TaylorMade’s “Speed Pocket” technology to promote increased ball speed in the lower portion of the clubface for more consistent ball speed and launch conditions across the entire face. The head’s length, topline and sole-width are all slightly larger compared to the Tour Preferred MB. The Tour Preferred CB (SRP $899) is a full-fledged cavity back that TMaG says maintains the shape of a player’s iron and the elegant look of a blade when soled behind the ball. The Speed Pocket in the 3- through 7-iron features what TMaG calls “micro-slots” to promote faster ball speed across the face and higher launch, which promote more distance. TMaG says that helps make the Tour Preferred CB one of the longest player’s iron it has ever created. The short-iron heads of the Tour Preferred CB are compact with minimal offset, while the long and middle iron heads are slightly larger with progressive offset for more stability and easier launch. Each of the models are offered in 3-iron through PW, feature a hand-polished satin nickel-chrome finish and are equipped with KBS Tour steel shafts and tour velvet grips. 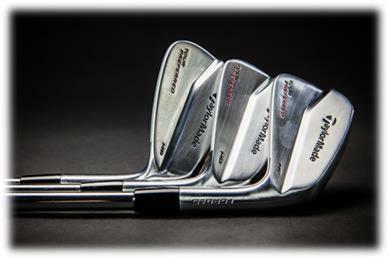 The Tour Preferred CB set features a 51-degree A-Wedge. Custom shafts and grips are available.